On a dark and deserted road, smalltown lawyer Svend Foyn is exposed to a drivers’ nightmare. A girl in her night gown runs in front of Svend Foyns car and lands on his Jaguar’s armor while driving in a deserted area without phone coverage. Svend Foyn manages to bring the girl quickly to the nearest hospital. The girl survives, but does not talk. Nobody knows who she is or how she ended up at highway 35 a rainy night. The mystery brings Foyn on a dramatic journey, from inner Vestfold in Norway to Europe’s external borders. And the fear of terror. Everything is connected, my friend. Or maybe not. The case Svend Foyn gets involved in, turns out to have many and unforeseen branches and gives Svend more challenges than desired. White Angel, Black Night is a stand alone novel in the series with small town lawyer Svend Foyn as the protagonist. 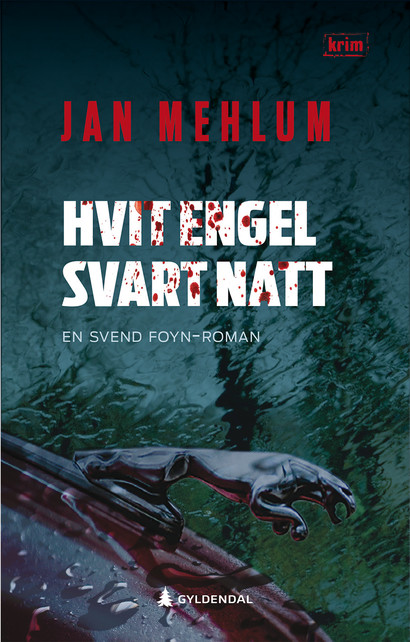 As usual, Jan Mehlum forces the reader to stay with his book until the last page, mastering his genre like few other Norwegian crime authors. Mehlum never spares the reader for the harsh reality, always making a plot that might as well have happened. But there is also humor and great entertainment, as always in his books. As always, the author finds a theme that concern us. The local and international perspective in a crime, written with a sharp pen and liberating irony. Ambitious story where the unworthy situation in refugee camps in Lesvos connects to a traditional criminal empire (...)It's easy to feel comfortable with Mehlum and Svend Foyn. Mehlum's writing style has something in common with Fredrik Skagen (...) You are hooked on this story immediately. The beginning of this 400 page story is graspingly intense (...) A strong story. (...) descriptions that are compelling enough to make this more than an average crime novel (...) Mehlum shows willingness to illuminate major societal problems and create entertaining excitement at the same time. It's a difficult balance, but "White Angel, Black Night" is as full of contrast as the title suggests. This is an intense crime. And it is up to date. Jan Mehlum delivers! The novel of the year with Tønsberg lawyer Sven Foyn is without any boring pause, in the sense that it reads quickly, there are no digressions , rather straight and done with it! But also sympathetic: no rough action with car chaseing and unconscious shooting! The author has a strong social commitment, which is reflected in the books and gives them an extra boost. He knows the art of combining well-considered societal criticism with a driving plot.